The Vienna Künstlerhaus is an exhibition buildidng on the Viennese Ringstraße. 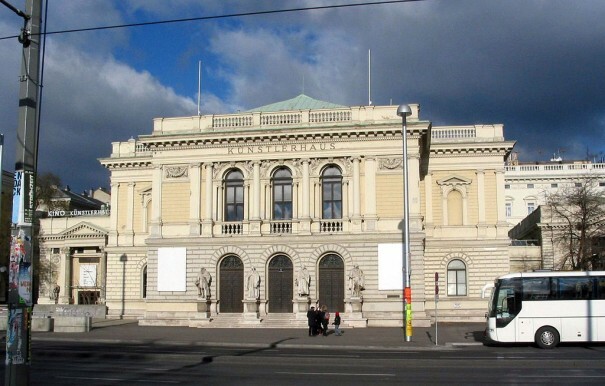 It is situated on Karlsplatz next to the Viennese Musikverein. The Künstlerhaus was built between 1865 and 1868 by the Gesellschaft bildender Künstler Österreichs (Austrian Artists' Society), the oldest artists' society in Austria, and has served since then as an exhibition center for painting, sculpture, architecture, and applied art. In 1897 some modern artists seceded from the Künstlerhaus and founded the Vienna Secession. Since 1947 the Künstlerhaus has also managed a cinema.